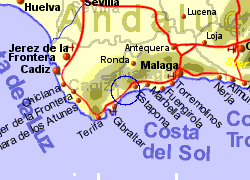 The village of Manilva is located approximately 3Km inland from the western end of the Costa del Sol (around hald way between Marbella and Gibraltar) although the municipality includes the coastline developments of Puerto de la Duquesa, Castillo de Duquesa and San Luis de Sabinillas. The area has been inhabited for sometime, as evidenced by stone-age remains in the limestone ridge above the village, and a bronze age fort. 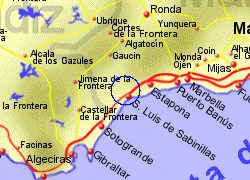 In the Castillo de Duquesa area, there are the ruins of a Roman fish processing factory, villa and baths. Much of the land around the village of Manilva is used for growing grapes for the production of sweet wine. 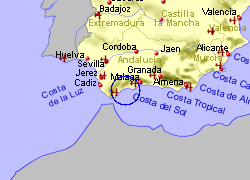 Map of the Manilva area.